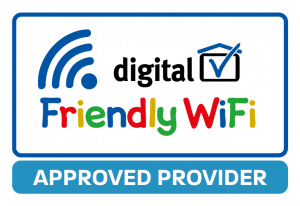 G5 Technologies is proud to be an approved provider of Friendly WiFi. It is the world’s first accreditation scheme designed to verify whether a public Wi-Fi service meets a minimum level of filtering to block out access to inappropriate and harmful websites. If you provide Public Wi-Fi services and apply for Friendly Wi-Fi then you can display the Friendly WiFi symbol to make it clear that their Wi-Fi meets a minimum standard of content filtering. So you know if you see the symbol below that access to pornographic material and child abuse webpages (illegal content) has been blocked. Sites blocked are those known to the Internet Watch Foundation.